Info "‘It might look stupid, but it’s effective!’"
Wario's Pinheads is one of Tiny Wario's Microgames in WarioWare: Smooth Moves. 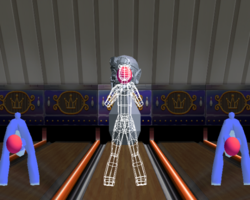 The player must swing the Wii Remote down and then forward to bowl the ball towards the pin that has Wario's head. 1st level difficulty: A massive pin. 2nd level difficulty: A fat pin. 3rd level difficulty: A thin pin. This page was last edited on February 20, 2018, at 17:55.